My name is Christy Clinton Phillips. I am being held in prison under violations of my civil and political rights I need help in fighting for the protection of these rights. The issue of my case in short form, is as follows: I was 15 yrs. old when my crime occurred and was sentenced to life in prison. According to the UN INTERNATIONAL COVENANT ON CIVIL AND POLITICAL RIGHTS(to which the United States is a party to) AND CRC(Convention/Committee on the rights of the child). a life sentence for a child is explicitly prohibited under article 37(a) of CRC and(article 6 the right to life, survival and development) paragraph 11 and paragraph 77. Under article 14(g)4 the court procedure must be such as will take account of a juvenile persons age and the desire ability of promoting their rehabilitation. In my case, the court did not take my age into consideration nor did they promote rehabilitation by sentencing me to LIFE in prison. “LIFERS” in prison are mostly denied access to rehabilitative services because of the lengthy sentence. Article 14(g) also prohibits law enforcement to cause a child to be compelled to testify against himself or to confess guilt. In my case, I reported a homicide, I was held in the lounge area of the Rialto Police Station over night and interrogated the next day. I requested to the interrogating officers three times if I could be taken to a telephone to contact my mother I was told that I could not contact anyone outside the police station until after I was interrogated. After being held away from home and in a police station over night, I was intimidated confused and tired so under duress I cooperated with them I was under the impression that I would not be allowed to go home until after I cooperated with them. During my interrogation the detectives made it clear that they wanted me to admit guilt and would not end the interrogation until after I had done so, I did and was convicted and sentenced to life in prison based on that coerced confession. 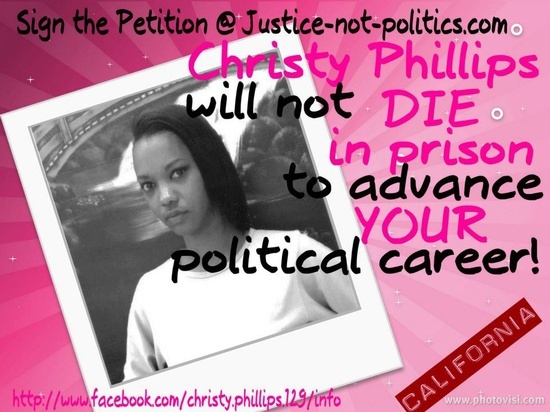 Posted on April 19, 2013 by My name is Christy Clinton Phillips	• This entry was tagged Christy Clinton Phillips JLWOP Justice Freedom. Bookmark the permalink.